You might read Hands are Not for Hitting by Aggasi, No Hitting by Katz, No More Hitting for Little Hamster by Ford and Baby Be Kind by Fletcher. You can teach “hands down,” by playing Simon Says and every third or fourth direction be “Simon says, ‘hands down,'” and encouraging them to put their hands by their sides. Or, play Freeze Dance with the direction “hands down” when the music stops. You can provide a visual cue by taking a picture of them with their hands down by their sides and show this to them when you remind them to, “keep your hands down.” This might be a reminder in general when they go to play, or your warning language if you see the behavior coming. You might practice a “gentle touch” or “nice touch” when you greet each other. You might show and tell them about ways to give high fives, shake hands, give a gentle hug or hold hands, and praise when they do it gently. Coach the triggers – The first step to being able to coach triggers is to identify them. It may be helpful to keep notes about the aggressive behaviors for a few days, be sure to note what sparked the behavior. This might be being told, “no,” having to share toys, getting the wrong color cup or rough house play that went too far. Coaching out of the moment might be role playing related scenarios, giving puppet shows, drawing a picture of the situation going well, providing a visual cue or reading related children’s storybooks. Here is a post about coaching wanted behaviors. The goal of coaching is to encourage wanted behaviors over time. It may be helpful to listen to my free online workshop on coaching wanted behaviors. As a parent, I tend to think the next step should be a logical negative consequence. Logical negative consequences are an imposed, related outcome. If they hit over a toy, they lose the toy for some amount of time. If they push for a particular seat on the couch, they are off the couch for that day. If there was no context, just a drive by, you might have them separate. This may be playing in another room or sitting out for a turn. Once this is served, it is good to either go back with a sentence of emotion or better choices. Also, it would be helpful to make a mental note of the trigger, so you can coach later. The fourth long run answer is coaching emotion language and empathy. I say long run because, two-year-olds aren’t expected to have much in the way of emotion language and tend to have a very limited sense of others. Since they are not well versed, it is good to include emotion language and impact on others in the moment. This would be, “I know you are frustrated. You wanted that toy.” and, “wow, your friend is sad. Grabbing his toy made him feel sad.” Out of the moment, helpful to coach these things as well. With all of this, remember you are talking to a two-year-old. This means when you are coaching or disciplining you only get a few short sentences. So often when children argue, parents intervene and solve the issue. Two children are arguing over a toy, a parent enters and decides who gets the toy and what the other child should do while they wait. Or, two children are arguing over who goes first, a parent comes in and picks which one while giving empathy or direction to the other. When parents intervene and fix, the children are missing out on a golden opportunity to learn the skills needed to solve such social conflicts. Rather than intervene and fix, it should be intervene and teach the needed skills. When children are arguing, a good first steps is often empathy all around. If my girls are arguing over a ball I might start with, “I know you are both frustrated, I could hear you from down the hall. You both want that toy.” This also teaches children to start with empathy which is often helpful. Teach them to listen to each other’s words. This might be, “Did you hear your brother? He said, ‘stop.’ What does that mean to you?” or, “I heard her screaming. She clearly doesn’t like that.” You are reinforcing the other’s words to each child. Often, by the time children are arguing, they aren’t listening well. If needed, teach them to speak up for themselves. Many children are all over this one, they speak up for themselves quite well. If your child is on the quiet side, you might have to coax some words out of them or give them some words to say, so they can at least hold their own. You might follow this up with reinforcing their new words to the other. It can be helpful to teach your child to use an assertive voice in conflicts. Once they feel understood or heard, the next step is to help them focus on solutions. You might ask them each to give an idea, or you might suggest a few ideas and discuss. You might teach them to weigh their options and negotiate together. The goal is to give them ways to find solutions and work through the issue together, rather than giving them the solution. This may take time and effort; it may take more empathy. It may also include taking a break and coming back to problem solving once children are calm. If the problem solving process continues to be difficult, you might step back and coach them to be more flexible thinkers. These ideas for teaching flexible thinking are best done out of the moment, when all are calm. Brainstorm options – Out of the moment of conflict, teach them how to brainstorm. This can be saying, “we don’t have time for bath tonight. Let’s think of three ways to you can get clean before school tomorrow.” Answers might include taking a quick shower, using a washcloth at the sink or taking a bath in the morning. On a game night you might say, “everyone wants to play different games. Let’s think of three ways we can settle this.” Answers might include one game each night for three nights, starting early or playing Rock, Paper, Scissors to decide. When brainstorming, it is fine to include funny or crazy answers. Big problem/Little problem – It can be helpful to have children decide what are big problems, and what are little problems. In our house big problems may take a few days to solve, or several people. A few days later, someone might be upset. Little problems might only take one or two people, and a little while to solve. No one is upset about it a day later. Point out big problems and little problems in life. Then have children try to categorize their own problems. Play games that require flexible thinking and discuss – This includes Labyrinth (by Ravensburger), Gobblet, Connect Four and Rush Hour Jr.. In all of these games, players have a plan and then it gets knocked out, and they have to make another plan. This may happen several times in each game. While you play, at least occasionally point out having to make a new plan or come up with new solutions. When children are able to work through arguments, be sure to give them descriptive praise for their efforts, negotiation, flexibility or cooperation. Here is a post about descriptive praise. The steps of positive discipline provide parents with a framework for moving through any discipline exchange. For most all behaviors, the idea is to work forward through the steps and consider which are needed or are the best fit. I tend to get through most discipline exchanges with empathy and choices or positive intent and choices, but that may not be what fits best for you. It is good to stay flexible. It is also helpful to note that there are several ways to stay in front of this discipline including: considering logistics for ways to solve behaviors, checking your routines and schedules to avoid struggles, and giving clear and consistent warnings to help children prepare themselves. There are also proactive discipline techniques such as giving positive directions and descriptive praise to encourage wanted behaviors and lessen the need for the steps of discipline. That said, sometimes the behaviors still happen. Here are the steps with definitions of each. For each step, I am providing an example for this scenario: Your child wants to walk at the grocery store but keeps pulling things off the shelf onto the floor. I message – I messages are a way to express your negative emotion and blame the behavior or the situation rather than blaming the child. This is either passive blame, “I am frustrated, this is a mess,” or, “I am worried, something might break,” or global blame, “I am frustrated, no one is listening.” The point is to diffuse the blame rather than blame the child directly which leads to defensiveness and arguing. I messages, empathy and positive intent are all foundation steps in the framework. You don’t tend to see a lot of behavior change from these steps, but they help to keep communication open and encourage the child to be a listener to what comes next. The next steps, including choices and consequences, are viewed as the active steps of the framework which lead more towards changes in behavior. Choices, Challenges or Contribution – These are ways to encourage the good behavior while avoiding consequence language. These techniques are more open and flexible than consequences. Choices would be, “do you want to hold my hand or help push the cart,” or, “leaving everything else on the shelf, do you want to choose the cereal or the cookies next?” Challenges would be making up a game or making it fun, “can you duck walk on the center tiles all the way to the other end of the aisle,” or, “can you count how many characters you see on the cereal boxes?” Either way, they aren’t focused on pulling things off the shelves. Contribution is giving the child a job to get them through the behavior this might be making the child the ‘list checker’ or the ‘cart organizer,’ rather than just walking. As a parent, when one child hurts another, I tend to work through the steps backwards and start with a logical negative consequence. This is mostly because I want it to register differently to my child. I want them to realize, “oh, when I hurt someone this all works differently.” The only way for it to register this way is to work forward for all other behaviors and avoid starting with negative consequences unless there is aggression. Attention to victim first – As hard as it is, avoid initially looking at or speaking to the child who was just aggressive. Turn your initial attention to the victim child saying something like, “I am so sorry. Are you okay?” This avoids giving that initial attention to the aggressive behavior and accidentally reinforcing it. I am not saying comfort, snuggle and go overboard, just avoid initial attention to the aggressive behavior. Logical Negative Consequence – Again, as best you can, it’s good to give a consequence related to the scenario. If they were pushing over a toy, the other child gets the toy. If they were hitting over a spot on the couch, the other child gets the couch. It can also be fine to end the activity or leave the situation, just be sure to tie it to the behavior as best you can. Empathy or Positive Intent then Choices – The consequence is where many parents end the exchange. I think it’s best to go back through empathy or positive intent and better choices for the exchange. It is going to be good to redirect the child to better behaviors following a consequence for aggression. If aggression is happening often, it can be helpful to also coach being gentle or other related skills out of the moment. Coaching might include reading stories like Hands Are Not for Hitting by Aggasi and No More Hitting for Little Hamster by Ford. This might be brainstorming ways to be gentle, practicing gentle touches and making lists about how to treat people. It’s good to also coach any known triggers. If you child is hitting over taking turns, coach how to take turns by role playing, giving puppet shows, drawing pictures of it going well and drawing comics that teach the point. There is a free audio workshop on coaching wanted behaviors available at parentingbydrrene.com. To learn more about this and other discipline techniques you can join me for a workshop in Northern VA. Listen to my audio workshops online. Or read my workbook: 8 Weeks to Positive Discipline. Four-year-old Johnny and Eric are building together. Eric moves one of Johnny’s blocks when Johny had it in the perfect place, and Johnney gets mad. Johnny yells, “no!” and hits Eric. This is a common scenario that plays out on playdates, between siblings and in preschools every day. As a parent or teacher, it can be hard to know the best ways to follow up in the moment and encourage better behaviors moving forward. I tend to start with a little attention to the victim first. In this case, I would turn to Eric and say something along the lines of, “I am so sorry. Are you okay?” I am not saying gush and comfort in a big way. You don’t want to encourage the victim role. Just give momentary attention to check in, and be sure they are okay. The point is to avoid giving intial attention to the child being aggressive. As a teacher entering into the discipline process, you might start with brief empathy to Johnny, “I know you are angry, you were building that,” or positive intent, “you really wanted the blocks the way you had them.” When it seems appropriate, and in this case it would, you can help the child find better words to express himself. Again briefly, you might say, “Johnny, next time you can say, ‘Eric, don’t move that,’ or you can ask me for help.” The next step is a logical consequence for the aggressive behavior. This might be having Johnny leave the block area for the morning for hitting his friend. A logical consequence is meant to curb the behavior moving forward. As a parent, I tend to think the discipline process works in the reverse when there is a aggressive behavior. When a child hits their sibling or a friend on a playdate, I would start the discipline with that logical negative consequence. Once served, I’d work my way back through the empathy or positive intent, and back through a conversation about choices. The reason is, I want this to register differently to the child than discipline for other behaviors. If in response to other behaviors, you work in order from I messages and empathy to ending with consequence language, it may help to limit the aggressive behavior by starting with the consequence. Here is a link to previous blog posts that goes into more detail about the Steps of Positive Discipline: https://parentingbydrrene.com/?s=steps. In addition to the steps, it can also be helpful to include other-oriented consequences. This would be saying things like, “look how sad your friend is. He doesn’t like getting hit.” This is meant to help your child realize the impact their behavior has on other people. Reading Children’s Storybooks – This includes No More Hitting for Little Hamster by and Hands are Not for Hitting by Agassi. Telling Your Own Stories – If you’re creative, make up your own stories about how to be gentle and why. Asking Hypotheticals – This is asking your child “what if” questions related to the behavior of concern. In this case, that might be asking, “what if you and a friend were playing cars, and your friend took a car you were playing with, what would you do?” Follow that with a conversation about their answers and best ways to react. Role Playing – When things go poorly, go back and role play the situation with your child striving for better outcomes. Puppet Shows – This is a lot like role playing, but it may capture the child’s attention in a bigger way. Again, focus on positive behaviors and outcomes. Drawing Pictures of It Going Well – If your child likes art, this may be another way to coach behaviors. Draw pictures of it going well or make cartoons of their scenarios. Yes, all of this takes time and effort, and this tends to be more helpful than discipline alone. I am feeling stuck in a difficult situation. I have three children under five years old, and have been fortunate to be friends with our neighbor who has four children, three in the same age range. It was a great situation, we live so close and the kids enjoyed playing together. Unfortunately, one of her children has been diagnosed with special needs and has become increasingly aggressive towards my children in the last year. When the kids first became friends, he was only aggressive towards his own siblings, but now it is towards my kids, and it’s often. Recently, he pushes, scratches, headbutts, hits or kicks my oldest every time they play together. The behavior is impulsive and erratic, most times my child isn’t doing anything to provoke, and it can happen with an adult right beside them. One minute they are playing, the next he is pushing or scratching. The most frustrating thing is that my oldest (who has been the repeated victim) head butted his own younger sibling yesterday, something I never thought would happen. I don’t want my children hurt, and I don’t want them learning the behavior. I am also fearful this child is really going to hurt someone. My concern is such that I don’t want my children to play with this aggressive child. How do I handle things with the neighbor? What do I tell my son about the aggression, so he’s not confused by being hurt by a playmate and doesn’t learn the bad behavior? Also, I am fine with the other children in the family, they all play nicely. Can I invite just them? We’ve become good friends with the neighbors ourselves and go out together and celebrate occasions together. Is there a way to keep the other relationships and avoid play with the one who is having such difficulty and seems to be getting worse? There are so many questions here with lots of options. Your primary concern is and should be your own children, their safety and what they are learning from these incidents. Part of the message they are getting rests in the follow-up that happens when this child is aggressive. Are you or the other parent addressing the behavior? Some parents give up as it happens so often and chalk it up to how kids play. If this is the case, your child is learning that behavior gets a pass. If the mom is addressing well each time with consequences and coaching how to play nicely often, hopefully your child is also seeing this piece to understand it is an unwanted or unacceptable behavior. If you continue to play as things are, I think you’ll need to address with the mom how this should be handled each time. Ask that it be consistently addressed when the children are playing together. Be sure you are both comfortable with being able to follow through. Even with a consistent follow through, your children are learning from his behavior. That they see aggression in play makes it more available as a behavior to try themselves. If you choose to continue the play, you might try to change the play that is available. 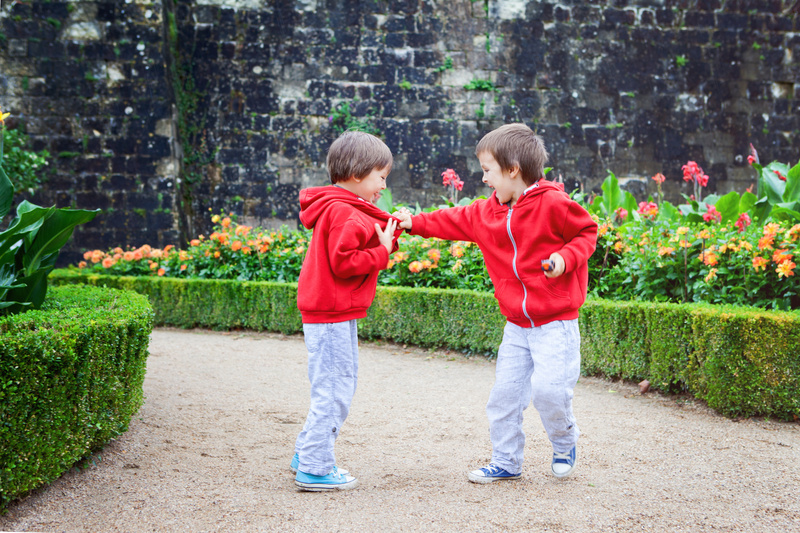 Children tend to be more aggressive in unstructured open play. You might limit play to field trips, bowling or movies. When they are at the house, you might invite them over for painting on big paper then snack and goodbyes. The idea is to fill their time rather than just go play. We had a relative whose child was particularly aggressive when the girls were little. We talked about it and for a few years opted to just get together for outings rather than open play. Honestly, there were hurt feelings, but a few years later we were able to go back to regular play. You might also have one parent “shadow” him. In our preschool shadowing would mean one teacher stays within arms reach. This is so they might see it coming and be able to intervene early or at least stop it quickly if it starts. The idea would be to allow play but be watching and close at all times. You and mom might also look for triggers and cues for the aggression. While you say it seems to happen out of the blue, likely there are things that set him off and signs he gives before the aggression. Triggers might be another child having a toy he wants, being told no, very close physical play or having to wait. Triggers are the things that set him off, and, if you can learn what they are, you have a better chance to intervene. Cues are signs he’s about to be aggressive. Some children get tense shoulders, others get a wild look in their eyes or their voice goes up a notch. The idea is to look and listen for cues and intervene on the cue rather than the behavior that follows. All this is a lot of effort and assumes you are going to continue the play. I think you are also perfectly reasonable to decide to end the play at least for now. If this is the case, you can offer to maintain the play with the other children in the family, but be prepared for the mom to decline. It may be too difficult for her to separate her children this way. You can also suggest keeping the parent relationship going, but again this may be declined. Either way you go with the above, you will have to speak with the mom. When you do, this avoid blaming her or her children. Talk about your concerns for the safety of all, that your children have started being more aggressive with each other recently, and you are working to curb that. Or, you could just opt to let this whole relationship go quietly. This means to stop making the invites and politely decline when invitations are made. Eventually, she may push you for an explanation and giving that is up to you. I hope something in here is helpful. Recently I asked my husband’s best friend’s three-and-a-half-year-old daughter to stop pushing our one-and-a-half-year-old daughter, her mother got upset. Her response was that the children have to learn to resolve the matter themselves. Is it okay to discipline your friend’s children if the parents don’t react to their kids aggressive behaviors towards your own child? You did the first thing I would suggest. If another child is aggressive towards your child, and the parent is present, I would ask them for their help. When you do this, be sure to avoid blame language. Stay away from saying things like, “your child is being bad,” or, “don’t you teach her any better?” If there is blame in your language, the other parent is less likely to listen or help. Instead blame yourself or the situation. Say something like, “I am at a bit of a loss here, could you help?” or, “I’m not sure how to best handle this, have you dealt with this before?” You will find some parents are readily helpful. Others, like your friend, aren’t so helpful. If the other parent isn’t around or is not helpful, I think you are always within reason to speak for your own. This means to address the situation by speaking for your own child rather than disciplining the other. You might say, “ouch, that hurt her! I can’t let her get hurt.” or, “she wasn’t finished with her turn. She’d like that back.” Here, you are modeling the language you want your child to be using in the future. It would be good for her to say, “ouch, that hurt! Stop it.” or, “I wasn’t done with that. I’d like it back.” You are erring on the side of speaking for your own without disciplining the other. I do understand your friend’s idea that children need to learn to work it out on their own and you want to give them some space to develop social skills, BUT when they start hurting each other they are stating very clearly that they don’t yet have the social skills necessary to work this out. When it starts to go poorly, it is still up to parents and teachers to step in, teach the needed social skills and to guide the children through the problem solving process. For sure, this is the case at one and three years old and continues to be the case as children continue to struggle. I attended your Positive Discipline class. Every time Sean (22 months) goes to hit someone, I say, “Hands down: hitting hurts” while holding his hands down. He seems to find this funny and just laughs every time I do it. Once his hands are free; he hits again. I don’t feel like I am getting anywhere. No matter how much I practice the “I” messages and empathy, he seems to overlook all that and go for the jugular. For example, he is transitioning to the two’s class at daycare. Today, he was very upset about this, and as soon as we got to the class room, he starting trying to hit a little girl that came over to play with him. I practiced the positive discipline technique described above to no avail. I am realizing that Sean is a very willful child, but I need to be able to rein in this aggressive behavior. Any other ideas would be appreciated. The I messages and empathy at this little age are to build emotion language and to calm the caregiver. They don’t tend to have a big impact on behavior until a bit later (3s) when children better understand their impact on others and reflect a bit on behavior. With that said, keep using the language because eventually you want him to use the language rather than the hitting, so he benefits from the continued modeling. The idea is also to coach and practice the better behaviors out of the moment when no one is hurting. So, tonight when you tuck him in, you might say, “I am touching you in a gentle way. Be gentle,” while you touch his arm softly. Then say, “Can you touch mommy gentle?” (Hopefully) “Yes, that’s gentle! I like when you are gentle.” You are actively teaching a gentle touch. Do this every few days with similar language, and then start to incorporate that language as you coach in the moment; as he approaches a new friend, you might say, “Be gentle, gentle touches,” and, hopefully, you are ready to say, “Hands down,” and curb before it actually occurs. But you can’t really start that and expect it to be effective until he gets the basic concept. Right now, it is curbing such as “hands down” in a firm tone. If you can get in front of the behavior so to curb before it happens each time all the better; this means, expect it rather than be surprised. You could be coaching him as he approaches another to “be gentle.” The idea is to first coach and practice the better behaviors out of the moment when no one is hurting. So, tonight when you tuck him in, you might say, “I am touching you in a gentle way. Be gentle,” while you touch his arm softly. Then say, “Can you touch mommy gentle?” (Hopefully) “Yes, that’s gentle! I like when you are gentle.” You are actively teaching a gentle touch. Do this every few days with similar language, and then start to incorporate that language as you coach in the moment; as he approaches a new friend, you might say, “Be gentle, gentle touches,” and, hopefully, you are ready to say, “Hands down,” and curb before it actually occurs. But you can’t really start that and expect it to be effective until he gets the basic concept.